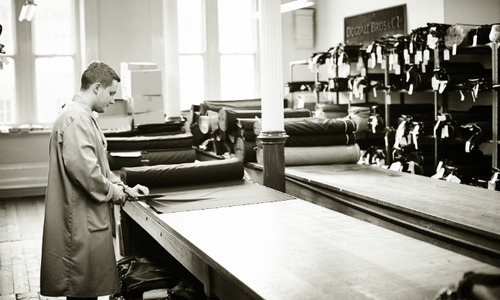 Dugdale Bros & Co is one of the world’s foremost fabric mills, and the last remaining cloth merchant of Huddersfield, the town thatgave the world luxury cloth. Establishedin 1896, the company is today recognised for its innovation in English cloths which are exceptionally lightweight and high performing. 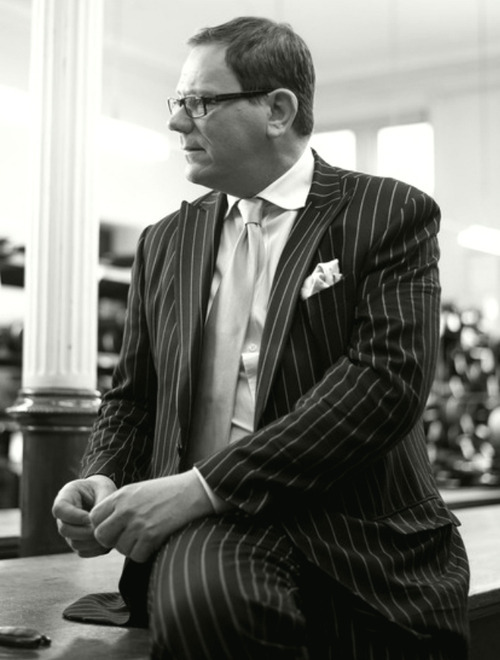 Here we meet the maker, the Managing Director and Owner, Robert Charnock. Huddersfield is called the ‘champagne region’ of the fabric industry, why is this? Historically the finest worsted production has centered on the town, which in turn is due to the geography and geology of Huddersfield. Pre-industrial revolution it was documented by inhabitants that the abundant water flowing from the Pennine Hills surrounding Huddersfield gave excellent results for the washing of wool. The hills are formed from Yorkshire millstone which leaves very few impurities in the water that flows through the valleys and hills, and the resultant Pennine water is incredibly soft. Can you describe this building to someone who had never visited? Originally built in the 1800s as the town’s main post Office, Dugdale moved here in 1906 when the Post Office moved into its new premises directly opposite. It’s an imposing and majestic building constructed in local Yorkshire stone, and the inside retains many of the original features including oak panelled walls and ornate pillars supporting all five floors. The building is affectionately known as ‘The Towers’. Dugdale Bros & Co was founded in 1896, what have beenthe most significant changes in production over the past century? The developments in manufacturing has afforded us the ability to make finer and lighter cloths, in some cases paperweight cloths in wool and noble fibres, and often a mixture of both resulting in lightweight, luxury cloths. In 1915 the average weight of cloth would have been around 540 grams whereas in 2015 average weights are 280 grams. Producing lightweight, luxury cloths has meant Dugdale cloths now find favour all over the world. Dugdale is recognised for its luxurious finish, how is this achieved? Huddersfield is one of the most important factors. Being based in the centre of the town that gave the world luxury cloth means that we have available the skills we require for our cloth – skills that have been developed, enhanced and improved over several centuries. Whilst throughout the process of manufacturing our cloths we deliberately select best of class processors, from the finest woolgrowers in New South Wales, Australia to W.T. Johnson, the oldest and most renowned cloth finisher in Huddersfield. The result is our distinctive range of luxury cloths with the ultimate label of quality woven along every selvedge of our cloth ‘Made in Huddersfield England’. After more than a century in business, Dugdale Bros & Co is still an independent family business. How important is this to the company? Very. Although I’m not a Dugdale, I am the fourth generation of cloth worker in my family; my father bought the business from Betty, the last Dugdale in line, having worked for the company for over 20 years. In turn I bought the business from my father back in 2000 and the original Dugdale motto ‘With Pride, With Passion, With Integrity’ is still our guiding principle. Where do you see Dugdale Bros & Co in 10 years’ time? Can you foresee any major changes? We are currently seeing good growth across all our major markets and ranges, but many countries have their own specialty requirements and this is seeing Dugdale producing more customer specific cloths - we are currently producing a super 190’s and silk for a Japanese store group. In terms of production, we have successfully produced our Dreadnought Serge and Romney Tweed which will both launch later this year, and we are currently carrying out trials with worsted spun British wool which has always been regarded as too coarse to spin into commercially acceptable yarns. We opened our first London showroom in 2014 and we are currently looking at a showroom in New York, it would be great to see Dugdale offices across the globe. Can you tell us an interesting fact we wouldn’t know about Dugdale Bros & Co? During both World Wars troops were billeted at ‘The Towers’. There are still stoves and open fireplaces in the building dating back to the First World War period, we believe the troops formed the guard of the West Yorkshire Regiment.